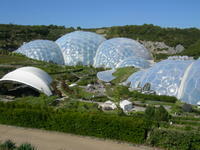 I've tried to visit the Eden Project several times but never made it as it was too crowded to bear the queues for parking and entry so popular is the site. But visiting friends in Cornwall over the weekend I tried again. With the holiday season over and the children back at school, it was, by its visitor numbers, almost deserted. Physically the biomes or giant plant conservatories are impressive and it's brilliant what the project did in reviving an old china clay pit to create a place that explores human dependance on plants and the natural world. Its impact on the the local economy - in 1998 when building first got underway the area was one of Cornwall's poorest - has been huge. But and there is often a but; for a fairly experienced gardener with an interest in the environment, and I think most gardeners share this, it was a bit like preaching to the converted - although with a sense of humour. Like the project guide says "Yes, we want to live lightly on the planet, but with champagne in our veins, not denial and hair shirts." Not surprisingly vegetables are prominent and there is a fabulous display by the cafe, at once practical and decorative. But don't expect it to be purest in any sense - one of the tomato varities growing was Golden Sweet, a 'doer', tastes good, but an F1 commercial variety which seed savers know is not likely to come true. I'm spoiled as I've visited the humid tropics, I live in a temperate climate and I've been to large scale conservatory created climates before - although not on this scale. Would I visit again - yes if I'm on a Cornish garden tour or visiting friends in the area but I wouldn't make the 300mile trip from London specially to do so. Instead take a virtual tour on the web and experience Tim Smit's enthusiasm for yourself. Ah yes, the Eden Project is a wonderful place but absolutely swarming with people ... I suppose we should be glad so many people are interested in it, but like you I made a point of visiting slightly out of season when the crowds were more bearable. I notice Golden Sweet F1 tomatoes are now listed in the 2007 T&M catalogue, but I'm not sure whether or not it's the same variety you're growing. If it is, it'll be interesting to see how true to type the fruits are! I'm all for growing seeds from F1 hybrids just for the element of surprise! Yes, it is great that some many go - especially those for whom sustainability etc is not high on the agenda - they will come away having learnt something. And judging by the comments I overheard there were quite a lot like that. Also with the steep slopes in the biomes I quite liked the idea of belaying gardeners swinging about on ropes. Many challenges there!